Greetings again from the darkness. THE STEPFORD WIVES was stocked with some men’s ideal of the perfect spouse … attractive, dutiful, always ready to serve. In director Bjorn Runge’s adaptation of the novel by Meg Wolitzer (screenplay by Jane Anderson), Joan Castleman is all of that and more as she constantly caters to her literary giant of a husband, writer Joe Castleman. It’s 1992 in coastal Connecticut, and in only a few days, things will change dramatically for Mr. and Mrs. Castleman. When we first meet this long married couple, they are in bed – she’s sleeping soundly, while he’s full of anxiety and anticipation over a phone call that may or may not happen. See, Joe is up for the Nobel Prize in Literature, and when the early morning call from Stockholm does come, Joe eagerly prompts Joan to listen in on the extension (it’s 1992, so these are land lines). As the authoritative voice on the other end announces Joe’s prize, it’s the look on Joan’s face that tells us that, for her, this is no celebratory moment. The facial expression is quite powerful, and it’s our first inclination that 6 time Oscar nominee Glenn Close (as Joan Castleman) is delivering a performance as memorable as her work in DANGEROUS LIASONS and FATAL ATTRACTION (only this time there’s no bunny). Jonathan Pryce is spot on as the narcissistic Joe Castleman. He’s clearly addicted to the pedestal upon which he sits and the corresponding adoration from worshipping fans. He’s the type of guy who thinks he’s doing Joan a favor by mentioning her in his speeches and calling her over to be part of his oh-so-important conversations. But as good as Mr. Pryce is, this is a tour de force from Ms. Close. She’s always a step ahead of her husband – finding his glasses, ensuring he takes his pills, and monitoring his diet and sleep. It’s the Nobel Prize phone call that stirred some long-suppressed feelings; lighting a fuse that will leave us anxiously awaiting the fireworks. Max Irons (Jeremy’s son) plays an aspiring writer and son to Joe and Joan. David’s bitterness towards his father is evident throughout and his desperate attempts to gain his father’s respect are nothing short of heart-breaking. Christian Slater plays Nathaniel Bone, a would-be biographer of Joe Castleman … if only Joe would give him the time of day. Nathaniel is often quite intrusive in his pursuit of the truth – at least what he hopes it would be since it would make a fantastic book. Karin Franz Korlof plays Linnea, a young photographer assigned to Joe during the Sweden trip. It’s an odd role as none of the other winners have their own photographer … but not as odd as the small talk amongst the various category Nobel winners. Those scenes, and the verbal exchanges, are as awkward as one might imagine. Director Runge utilizes flashbacks to 1958 Smith College to provide us a foundation and narrative for the relationship between Joe and Joan. She was once a budding star writer under the tutelage of the young, married professor. Her flirting, babysitting and writing all worked to win Joe over, and they were soon married. Young Joe the professor is played by Harry Lloyd (great-great-great grandson of Charles Dickens), and young Joan is played beautifully by Annie Stark (Glenn Close’s real life daughter). These early days and an encounter with a broken female writer (played terrifically by Elizabeth McGovern) lead Joan to surrender her writing dreams and put her support behind her husband. Shooting down the purity of “a writer must write”, McGovern’s beaten down character instead says “a writer has to be read”. 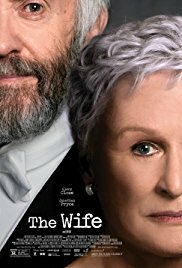 Glenn Close will likely receive much Oscar chatter for her role. Her transformation from dutiful sidekick to self-enlightenment is a performance laden with subtle and nuanced signs of resentment. Her early disquiet could be compared to a volcano – the inside building towards eruption while the outside remains strong and majestic. Living a lie never becomes truth … even after 30 plus years.